Vivanco also thumbed through 19th-century directories of Burlington businesses with assistance from UVM special collections librarian Prudence Doherty, who once worked at a bike shop in Chicago. Those listings revealed that many merchants sold and repaired bikes along with a variety of unrelated items. Quite a few stores advertised sewing machines as well as bicycles, Doherty notes. In addition to such obscurities, Vivanco unearthed some ironies. He points out, for example, that bicyclists were fighting for smoother roads more than a decade before the first motorists chugged onto the scene. And, then as now, fiercely committed and sometimes self-righteous wheelers were seen as elitists who could afford contraptions priced beyond the budgets of most Vermonters. Reckless bikers of yore, who were known as “scorchers,” also incited “moral panic” on the part of the gentry, and actual panic among equestrians due to their “transgressive and subversive” riding style, Vivanco relates. By the 1920s, the sun had set on that first golden age of cycling — not only in Vermont but throughout the increasingly car-crazed United States. “Bikes were relegated to sporting-goods stores and came to be looked upon as children’s toys,” Vivanco says, sipping from a bottle of water one recent morning at New Moon Café on Cherry Street. Youthful looking with his reddish goatee and full head of dark hair, the bespectacled Vivanco might be mistaken for a UVM grad student; the 42-year-old is the tenured director of the university’s international studies program. The son of a Chilean father and American mother, Vivanco earned an undergraduate degree from Dartmouth and a PhD from Princeton. He briefly worked at a law firm in Washington, D.C., but left for a five-month backpacking adventure in Africa after deciding that “corporate law is a big criminal enterprise.” At UVM, where he’s been teaching since 1997, Vivanco says he’s been able to take advantage of the school’s “institutional chaos” to pursue his own interests and activities. Cycling is foremost among those. He pedaled throughout his childhood in sunny San Diego and today owns five bikes, including the “urban assault number” — decked out with panniers, baskets and lights — that transports the poncho-clad and helmeted Vivanco on a rainy Thursday. He’s got another dozen or so bikes crammed into the garage of his Brookes Avenue home. Many of those belong to Vivanco’s three kids (ages 9, 7 and 2) and to his wife, Peggy O’Neil, who has worked for UVM’s study-abroad program. The whole family regularly rides along Burlington’s streets — not necessarily its bike paths, Vivanco emphasizes. “It’s important to claim your place on the road,” he says. Vivanco also wants it known that he’s a “utilitarian cyclist,” as opposed to a recreational biker. He’s learned to disassemble and repair his rides — a skill he also applies as a volunteer at Bike Recycle Vermont and that he passes along to students in his capacity as advisor to the UVM bike club. Vicanco rides year round, relying on a 1996 Gary Fisher Mount Tam mountain bike with studded tires to take him safely through snow and ice as he pedals to appointments and errands. You won’t see him primping in a Lycra biker costume, either. He makes a point of wearing workaday clothes in order to signal that cycling can be a healthy, enjoyable and efficient way of getting from here to there rather than a fashion statement on two rapidly whirring wheels. As a Burlingtonian intimately acquainted with local biking conditions, Vivanco supports initiatives such as the striping of Colchester Avenue to make it less hazardous for cyclists — and probably for drivers, as well, he suggests. The region’s bike network remains “badly fragmented,” however, with semi-suicidal conditions prevailing on all the main routes into and out of Burlington. Burlington Progressives, in power for all but two of the past 30 years, “should be the natural ally of cyclists,” but their party has instead proved itself “clueless” in regard to alternative transportation, Vivanco says. “It’s just astonishing to me,” he continues, “that their vision is pretty much to get people to go to Good News Garage.” Mayor Bob Kiss, Vivanco notes, drives a pickup truck the mile between his home and Burlington City Hall. The political consciousness is not so backward in Boulder, Colo., Berkeley, Calif., or Portland, Ore., Vivanco points out. Those similarly hip and student-influenced cities have been much quicker than Burlington to encourage a mode of transport that doesn’t pollute or promote uglification via suburban sprawl. 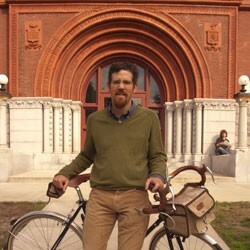 In his writings on biking’s history and contemporary status, Vivanco applies the precept of “cultural estrangement,” which, he says, “anthropologists bring to everything they study.” Critical consideration enables an observer to question why it’s “natural” to get into a car, and why streets — and, indeed, entire metropolitan areas — are designed to accommodate one-ton, steel-and-plastic shells powered by fossil fuels. The pedaling prof also brakes at lights and stop signs, explaining that he aims to cycle in a “consistent and predictable manner” so cars will keep a safe distance. It’s a style that’s helped protect Vivanco from injury throughout the thousands of miles he’s spun. Defensive cycling has also insulated him from the potential rage of drivers late for work. Motorists never yell at him, Vivanco reports. What’s his main motive for mounting up at every opportunity? And is cycling something almost everyone can come to appreciate? “It’s mostly about feeling good,” Vivanco says — culturally and politically, as well as physically. Pedaling at a 10-miles-per-hour pace along city streets enables him to “interact with my community while moving at a pace my brain can handle.” There’s a planetary as well as a local dimension to cycling, Vivanco adds. His book examines that big picture from an anthropological perspective. Bikes are “globalized commodities” used in every human society, he says, pointing out that in one recent year, far more bikes than cars were manufactured worldwide: 130 million versus 70 million. Understanding bicycling’s resurgence, as well as its transformative potential, “requires exploring bikes’ histories and transnational contexts,” Vivanco writes. His book sets out to achieve that, while it certifies his status as the pacesetter for an anthropology of bicycling.